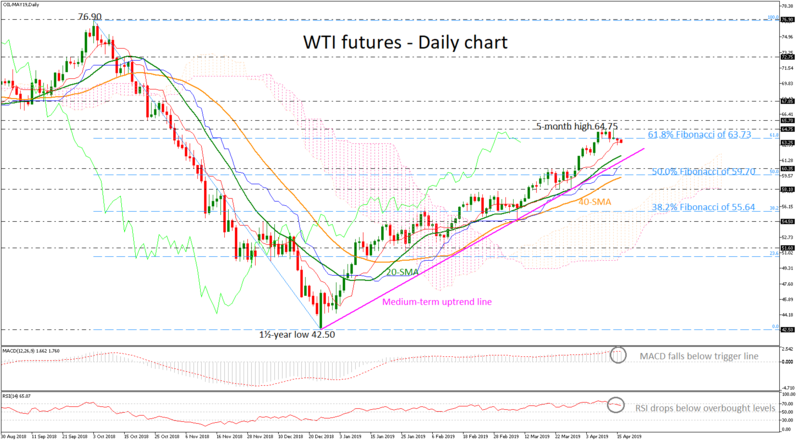 WTI futures recorded a stunning rally in the previous weeks towards a fresh five-month high of 64.75, marking a run above the 61.8% Fibonacci retracement level of the downleg from 76.90 to 42.50, around 63.73. This week, though, the price is on the backfoot and the technical indicators suggest that the market could ease in the short-term. The RSI is currently moving with increasing negative momentum towards its neutral threshold of 50 after an exit from overbought levels, while the MACD is slowing down in positive territory, both hinting that the next move in prices could be on the downside rather than on the upside. However, the blue Kijun-sen line and the Ichimoku cloud still confirm the upside tendency in the near term. If the price continues to turn lower, immediate support is coming from the 20-day simple moving average (SMA) currently at 61.87 and the medium-term ascending trend line around 61.60. Even lower the oil price could rest at the 60.35 support and the 50.0% Fibonacci of 59.70, switching the bullish outlook to neutral. Also, near these levels the 40-day SMA is providing support before the 58.10 barrier. On the other side, a jump above the five-month high 64.75 could endorse the medium-term uptrend move, driving the price until 65.70 and then towards the 67.85 resistance, taken from the peak on October 2018. In the medium-term, the outlook remains positive since prices hold above the rising trend line and the bullish cross between the 20- and 40-day SMAs.